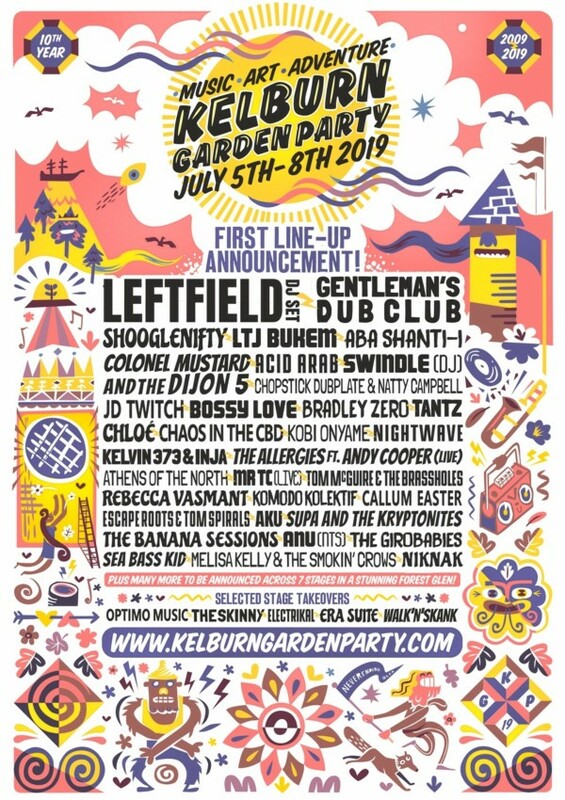 2019 will see Kelburn Garden Party celebrate its 10th birthday. Set in the grounds and glen around a 13th century painted castle! The line-up features a diverse range of musical styles and top quality performers. Aside from all the wonderful music, there is a huge amount of creative and fun attractions embedded around the site, from interactive art installations, living theatre, pop-up gigs to glen walks, waterfall plunge pools, poetry, magic and downright surreal happenings. The Kelburn Garden Party has sessions in the glen and gardens, pop-up raves with a giant chameleon or police party unit, to poetry by the waterfall, gong therapy and a giant slip’n’slide. Of course there is The Neverending Glen Art Trail, but also they have cabaret and theatre at Nuria Nights, late night jams with Roberta’s Chan Bang and Making Things Happen. Fire shows, interpretive dance, giant jam sessions and The Secret Forest Project… the list goes on!